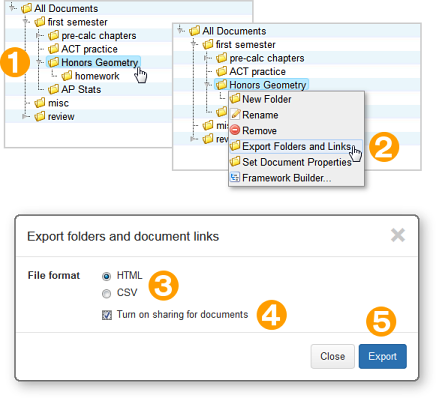 Problem-Attic has options for sharing your documents with other teachers. The sharing is done with “public links”. Very briefly, if you provide a link, then someone else can open a copy of your document in Problem-Attic. This has advantages over sharing a PDF, the most important of which is that the document can be modified: the other person can add and remove problems, change the formatting, etc. We list some other uses at the bottom of this page and in our overview of Problem-Attic’s curriculum development tools. Please note: public links are intended for teachers, and they're obtained on the Organize page in Problem-Attic. If you want to get your documents into the hands of students, or deliver questions to student devices, that is done on the Create page, on the Make PDF, Export and Score tabs. We don’t discuss the student options here, but you can read about them in Problem-Attic’s online help. Document sharing is a free option in Problem-Attic. It’s available to anyone who signs up, and it’s fast and easy to do, either for a single document or for many documents at once (if you make use of the folder system). Click Organize in the main menu. In the list of documents on the right, click the three-dot Properties button for the document you want to share. In the Document Properties dialog, turn on sharing. This is a security precaution. Later on, if you don’t want your document to be copied by anyone, you can turn off sharing. Click the Copy button to highlight the public link. Then press Ctrl-C (or Cmd-C on a Macintosh). Click the Close button in the dialog box. That’s it! After the link is copied, you can paste it in an email, put it on a school or district website, include it in a shared lesson, etc. Any teacher who clicks the link will be prompted to log into Problem-Attic (if not logged in already) and will get a copy your document. Right-click a folder that contains the documents you want to share. In the pop-up menu, select “Export Folders and Links”. In the Export dialog, choose a file format, either HTML or CSV. The HTML format is more visual. It shows your documents (with clickable links) in the same hierachical structure as on the Organize page in Problem-Attic. The CSV format is more data-oriented. It includes document links and other information that may be useful, such as number of questions and last edit date. Check the box labeled “Turn on sharing for documents”. As with a single document, this is a security precaution. Later on, if you change your mind about sharing, you can turn it off for some or all documents. To do that, right-click a folder and choose “Set Document Properties” from the pop-up menu. Click the Export button. The file should get downloaded automatically to your computer. What you do next depends on the file format and how you want to use the document links. If you downloaded an HTML file, you can open it in your browser, copy some or all of the links, and paste them into an email. Or you can integrate the code into a school or district website. You can see an example of the HTML format here. If you downloaded a CSV file, you can open it in a spreadsheet program and extract the links or other information that you want to use, say for a teacher blog or curriculum map (see examples above). The links are intended for teachers. 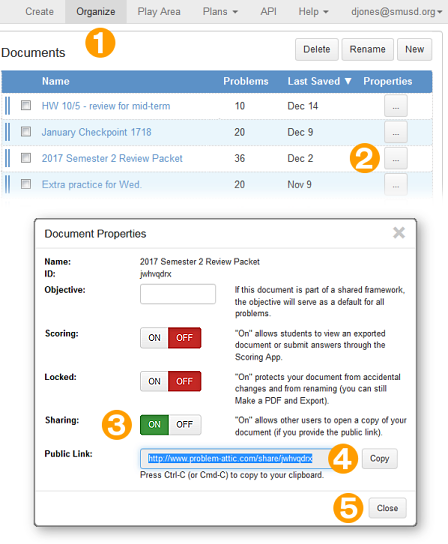 For various reasons, including the fact that documents opened through a public link will show answers in Problem-Attic, they are not a replacement for PDFs that you distribute to students. A person who opens your document gets a copy of it. Any changes that the person makes will not affect the original. One implication: If you are working on a document collaboratively, you will need to send updated versions back-and-forth. There is not presently a way to work on the same document in Problem-Attic (although we’re working on it). If you’ve posted a link, you can still stop people from copying your document by turning off sharing. However, this can be impolite if the link has been circulated widely, because people will then get an error message if they click it. You should generally not make a link public unless you intend to keep it that way, or you notify the people with whom you’ve shared it that the link is no longer valid. Public links don’t provide Problem-Attic users with any content they’re not already licensed for. If your document contains content that is available only by subscription, you can still create and share a link, and anyone can open a copy of the document. However, if licensing differs, the recipient will be warned that some or all questions are unavailable. To be courteous, you should not post a link that will frustrate other users, because they don’t have a similar license. If you’re not sure, stick with the content that is freely available in Problem-Attic. Or if you post a link on a public website, please advise teachers about what they’ll see. Licensing. Under Problem-Attic’s Terms of Service, there are limits on what you can do with PDFs. With few exceptions, you can distribute them only to students under your direct supervision. Public links have no limits, because you are not actually distibuting copyrighted material, only references to it. Editing. PDFs created by Problem-Attic are not editable. If you share a document through a public link, the recipient can make changes to it, such as adding, removing and re-arranging questions. Also, the recipient can change the format, output the document as a slideshow or online test, or use the questions for a different purpose altogether. Maintenance. When you distribute a PDF, it always exists in the same form. That may be advantageous for a single administered test. The downside is that no mistakes can be fixed. If you post a link instead, then you have an opportunity to fix a wrong answer or other mistake through the online editor. Similarly, by virtue of regular updates to Problem-Attic, the person who clicks the link is assured of getting the newest, most error-free data. Collaboration. Sharing of links is not the same as working on one document, but it is close. You can send a link to a colleague and she can make some changes and send a link back. This will give you copy of a copy of your original document, to which you can make additonal changes, send another link, and so on. If you keep track of versions, you’ll have a system where the copies act like backups or histories. Besides common assessments or review worksheets, we hope you’ll consider the following ideas for public links and you’ll also discover many more innovative uses. Mini-assessments. There are many lesson-sharing sites for teachers. You may want to attach a public link to a lesson as a mini-assessment or as a group of homework or follow-up questions. Professional development. If you instruct teachers on problem-solving methods, state standards, lesson planning, etc., you can provide the teachers with a set of questions for discussion or for practice editing or aligning. Curriculum management software. You can embed links in other programs. These could point to representative questions or documents that tie in with videos, classroom activities, textbook chapters, a scope-and-sequence, etc. We welcome your feedback about document sharing and public links. Here is our contact information.